Striking gables, arched windows, and a wrapping front porch grace the facade of this modest three bedroom home. The dining room, kitchen, and great room cleverly separate the master suite from the two family bedrooms. An efficient kitchen is strategically placed to serve both the dining room and great room with equal ease. Tray ceilings in the dining room and great room add volume and interest, while the master bedroom and front family bedroom are expanded by cathedral ceilings. The master suite features back porch access, a walk-in closet, and private bath with separate tub and shower. 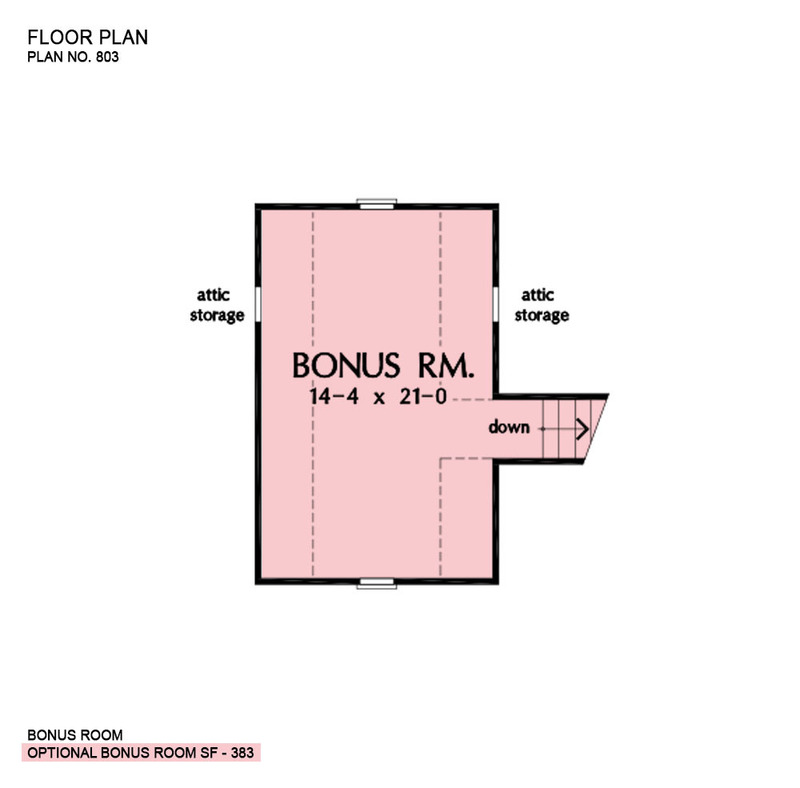 A bonus room over the garage offers space for storage or future expansion. 1st Floor: 1469 Sq. 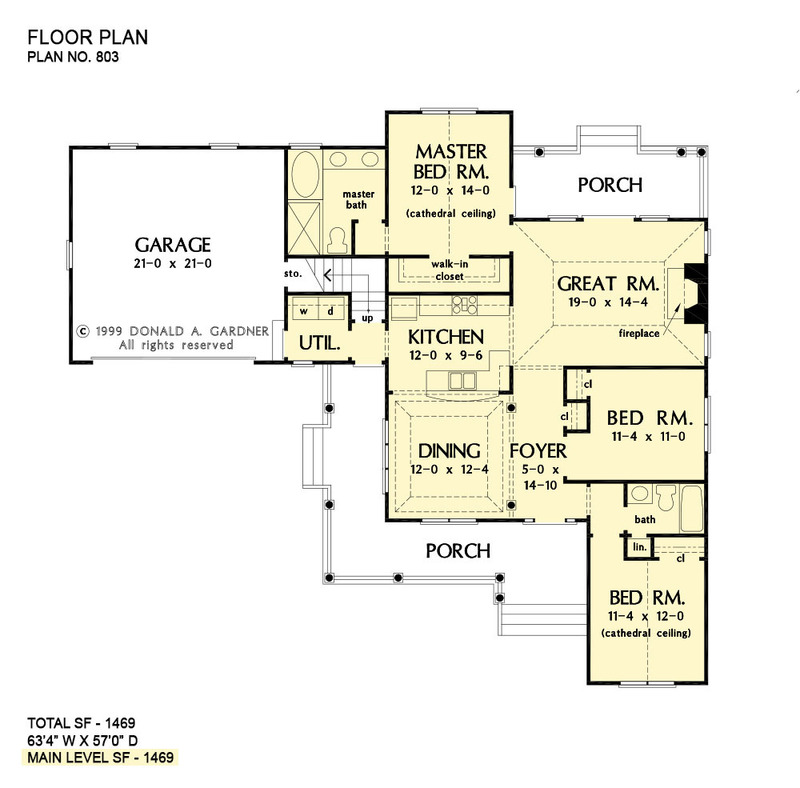 Ft.
House Dimensions: 63' 4" x 57' 0"
Great Room: 19' 0" x 14' 4"
Foyer : 5' 0" x 14' 10" x 0' 0"
Dining Room (Tray): 12' 0" x 12' 4" x 10' 6"
Great Room (Tray): 19' 0" x 14' 4" x 13' 2"
Kitchen : 12' 0" x 9' 6" x 0' 0"
Utility Room : 6' 0" x 6' 6" x 0' 0"
Garage Storage : 5' 5" x 3' 4" x 0' 0"
Master Bedroom (Cathedral): 12' 0" x 14' 0" x 13' 2"
Bedroom #2 : 11' 4" x 11' 0" x 0' 0"
Bedroom #3 (Cathedral): 11' 4" x 12' 0" x 15' 8"
Porch - Front : 26' 2" x 6' 2" x 0' 0"
Porch - Rear : 19' 4" x 7' 2" x 0' 0"